1500W POWERFUL HOT STEAM CLEANS AND SANITIZES (100% CHEMICAL FREE) - 212F (100C) hot steam naturally deep cleans, deodorizes and sanitizes without the use of harsh chemicals (use water only). Dissolves stubborn stains and removes left-behind dirt and residue from babies or pets, kills 99% of harmful bacteria and germs, kills fleas, parasites, ticks and their eggs from pets as well. The steam mop provides a NON-TOXIC environment for family, specially your kids and pets. PROFESSIONAL CARPET & FLOOR CLEANING SERVICES AT NO COST - The snap-on carpet glider to refresh carpet, deep clean the tough stains and sticky spots. 180-degree swivel triangle head is for easy maneuvering, and to clean hard to reach areas. Steam on demand: steam control settings that are optimized for each type of floor from carpet to wood. For light cleaning use MIN to LOW, and for the toughest mess use HIGH to MAX. Drying takes just seconds, so it's easy to clean anytime, anywhere. VERY USEFUL 6-IN-1 VERSATILE ACCESSORIES - Clean every area of your home and office: carpets, floors, bathroom, windows, grout, kitchen, ovens, and upholstery, etc. Microfiber steam mop is great for all sealed hard floor surfaces including tile, wood, vinyl and laminate. Lightweight design and firm shoulder strap make it easy to use. 3 pieces of microfiber pads are included. They are washable and reusable. Consumables can be purchased separately for your different cleaning needs. SAFE & CONVENIENT & GIFT SET - It's the safest way to clean your home, keep your family safe, and protect our fragile environment. - The sound alert system makes regular beeping sound when the steamer works in good conditions; it becomes louder if the water needs to be refilled. The sound is also important to remind you not to accidentally leave the steamer on. The overload protection system ensures product durability. - Premium gift packaging. 1. 1500W powerful steamer provides environmentally safe steam in 15~30 seconds. The 212F (100C) continuous hot steam delivers 99% sterilization against germs to deep clean and sanitize. 2. 100% Chemical Free steam mop is safe to use in your home or office. Kills bacteria while insuring a Non-Toxic environment for the family with kids, the elderly, pregnant women, or pets. 1. 180-degree swivel triangular mop head for easy maneuvering, and to clean hard to reach areas. 2. Steam controls are optimized for each type of floor from carpet to wood. For light cleaning use MIN to LOW; and for the toughest mess use HIGH to MAX. 1. 6-in-1 steam cleaner helps to clean laminate, carpet, marble, glass, tires, hardwood floor, etc. 2. The sound alert system makes regular beeping sound when in use; it becomes louder when water is to be refilled. The sound also reminds you not to accidentally leave the steamer on. 3. Overload protection system ensures product durability. 4. 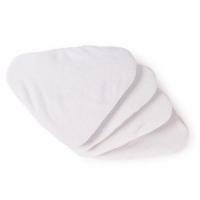 Three washable & reusable microfiber pads are included. Consumables can be purchased separately. Efficiently Moisturize and Refresh Your Skin Anytime Anywhere - Nanometer ionic cool mist penetrates into the basal cell layer of the skin, the cooling function shrinks the pores and makes skin firmer. One minute session is sufficient to rejuvenate and hydrate the skin. Perfect to be used with diluted facial toner. 10x more effective than facial mask. Provide the necessary humidity to help you set and refresh your make-up. Won't destroy you makeup. One Minute Timer & Portable Versatile Design - Great to have a quick skin rejuvenation in the office, on flights, outdoor, at home, in the car, etc. A must have for office lady. Help to relieve dryness due to air conditioned heated or cooled environment. An added value for the cold and dry winter! The cool, refreshing mist is also ideal for the body and hair, can be sprayed on hair to revive waves. Perfect for curing eyelash extensions as well. 1-Minute auto shut-off feature for convenience. Nice Design for Ease of Use - Sliding design with compact mirror surface. Great size fits in your hand. USB rechargeable. Portable mini facial sprayer can be put into a handbag or makeup bag easily. Safe for all skin types, and can be used by both women and men. 12' inches spraying distance is longer than others. Works with distilled water or clean pure water at room temperature. Diluted facial toner is also fine. Please do not add lotion, milk, alcohol, honey, or high viscosity essential oil. Deluxe and Sleek - The handheld sprayer is coated with deluxe Piano Varnish. Sleek and shine facial mister easily complements your bathroom, makeup table or dressing area. Much more stylish than any plastic or glass spray bottles. Gift Set - It comes in a premium quality gift box, ready for gift giving to colleagues, friends and loved ones.